Appear popular, to become popular. You can thank us later. Our Automatic Vine Likes and Revines service follows your account and waits for you to post a new loop. The moment, we detect your new post, we add hundreds of Likes and Revines automatically! Unsure? Try 20 Likes & Revines on a single post for only $3.95 so you can try us out before subscribing! Do you have a specific Vine post you want a ton of Likes and Revines on? This is where you get Likes and Revines for individual posts. Buy Vine Likes For A Friend! Imagine their excitement when they get hundreds of likes & revines! 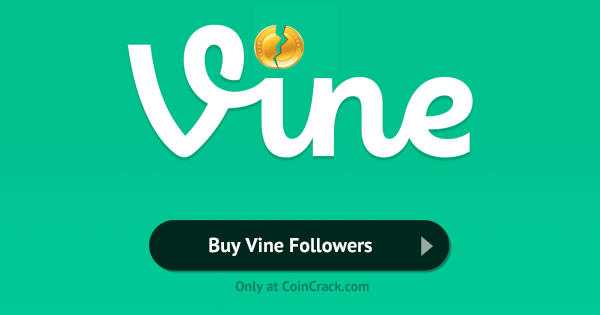 Just punch in their Vine profile/post URL during checkout and we'll make it happen. "So many more people appreciate my artwork now. It's amazing the response I'm getting." "I hit up CoinCrack almost every day for something. They're amazing!" When will my Likes and Revines be delivered? For individual posts delivery begins ASAP! We know how fast Vine moves. If your order is placed from 9am-9pm PST you'll get the fastest delivery. For subscribers of automatic Vine Likes and Revines, our engine checks your profile every 15 minutes for new posts and then Likes and Revines them instantly! What is with the random quantities? To make it appear more real, we genreate random numbers. So for example, we deliver 133 instead of 100. For Revines, we usually deliver 20% the number of Likes. So 133 Likes would get 27 Revines. Do Likes and Revines get added to posts I Revine? Nope. And Revining won't count towards your 3 posts per day limit either. How do I cancel Automatic Likes & Revines?? We don't want to see you go, but no hard feelings. You can cancel anytime via these PayPal or Coinbase recurring payment areas. Why only 3 posts per day? This is to prevent abuse of our system. If you need more, just ask, we can easily raise it for you. Our Vine packages work for business or personal Vine accounts, but make sure your posts are not set to protected posts. Do the people Liking me look real? Absolutely! They all have profiles and bios just like your friends. Who should I talk to if I have a question, problem or special request? You can contact us here or reply to any order confirmation email you receive from. We're always here and happy to help!